Indian food is often my go to comfort food. When the warm intense spices fill the kitchen with the scents of cumin, coriander, and mustard seeds, I feel at home. I also don’t feel guilty after eating a big meal because most of what I make from this unique spicy cuisine, is healthy (unlike other comfort foods like mac and cheese and mashed potatoes that I also adore). Indian food isn’t usually considered diet friendly because Indian restaurants often use a lot of oil and cream. And the Samosa, arguably the most popular Indian dish/appetizer, is basically potatoes and vegetables fried in dough. But since the traditional spices are strong and flavorful, it’s easy to make tasty Indian dishes with very little fat – especially vegetables. This recipe for Curried Carrots and Peppers uses just a little oil, spices, lemon juice, and touch of sugar. It makes a flavorful side dish (or main dish if you are full from all of that holiday food). Surprisingly, this recipe is from “The Art of Good Cooking.” It continues to amaze me how my grandmother managed to replicate and publish such ethnic recipes over 50 years ago, when so many side dishes still came from a can. Living in Harlem, she was surrounded by diversity and learned many of these recipes from friends or neighbors. 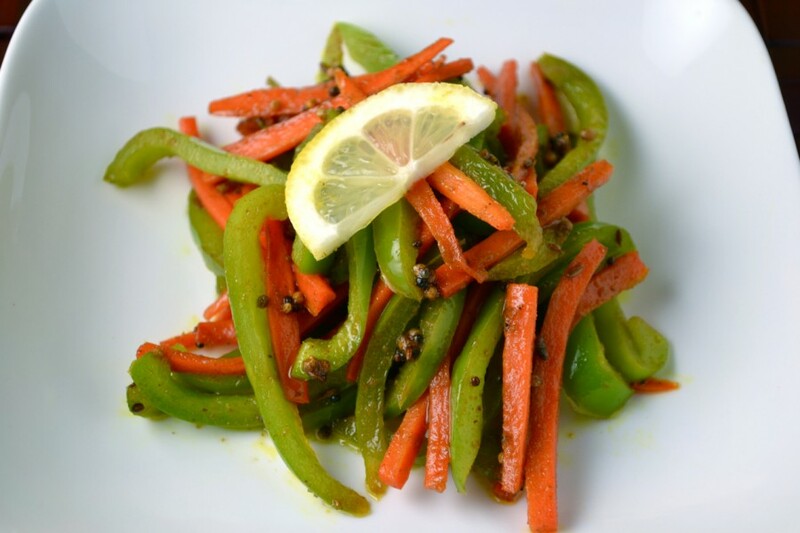 This dish, titled “Oza’s Carrots and Peppers” in her book, is an example of that influence. An obvious question is, who’s Oza? The introduction to the recipe mentions that Oza was an Indian friend and neighbor. Not long ago, I heard from Oza’s son. He mentioned that Oza, now 92, still has fond memories of my grandmother and grandfather. The only modifications I made to the original recipe is the amount of oil and curry powder (I believe curry powder was less potent in the 1960’s). I also prefer to make my own curry powder by using a combination of ground coriander, cumin, and turmeric (proportions below). The original recipe already had the fat, acid, and sweet components to make it the perfect party for your taste buds. As we fatten our bellies with baked goods and rich foods this holiday season, these spiced vegetables can provide a nice break for your body but still provide the comfort of the holiday season. In a deep saucepan, heat peanut oil until almost smoking. Add mustard seeds. Turn heat down and add cumin seeds, curry powder, and cayenne. Cook 2 minutes. Add sliced carrots and green peppers and stir into the spices. Cook until vegetables begin to change color but are still crisp. Stir in brown sugar, salt, and pepper to taste. Remove from heat and add lemon juice.